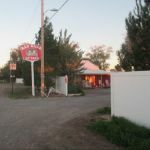 Ask fellow campers about "Red Barn RV Park" and nearby attractions. This small park is a jewel. The owner is one of the friendliest I've ever known. When we had an electrical issue, she was quick to find us help. They sell ice cream and drinks on the honor system in the office. The park backs up to a farm field and it was a pleasure to get away from the concrete. Sites were a bit narrow, but it didn't detract from the quiet of the park. There is road noise, but not enough to keep me awake. 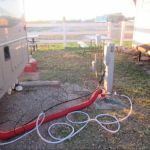 We camped at Red Barn RV Park in a Motorhome. If you have dogs, there is a great dog park downtown, called the Woof Bowl Dog Park on Grand Ave. Very large with two sections - for large and small dogs. Nice grass and trees. Our rating could have been near the top but.........the breeze died and the smell from the stock yard or farm.......what ever..... near by became overwhelming!! Access is easy, signage is good, check in was quick and very informative. The check in person, I suspect is the owner, was very friendly. Parameter roads are gravel as are the sites with a strip of grass between neighbors. Our site came with normal services and a table in the rear of the site. All amenities worked as expected except the Cable. A decoder box is required. We declined. A number of OTA channels were available. There is a book and video exchange as well as some snacks and ice available in the club house. All was neat,tidy and very clean. Full marks would have been given if the wind had of stayed. There are no stores or restaurants within walking distance. Given that the aroma would prevail at other parks in town...this is still probably still the best. . FYI I did not research back to the 2017 reviews. Had we done so, we would have been fair warned about the odor. We feel that we received good value for our dollar and would return if staying in the area again. We paid $25.88 per night including tax with a GS discount. We camped at Red Barn RV Park in a Motorhome. Small campground but easy to get to (about 2 miles east of Roswell). The sites are easy to get into. The owner was very nice and gave us a great recommendation for lunch. The only downside was the constant traffic. We are not sure where all of the cars were coming from as there was no close town east of Roswell. 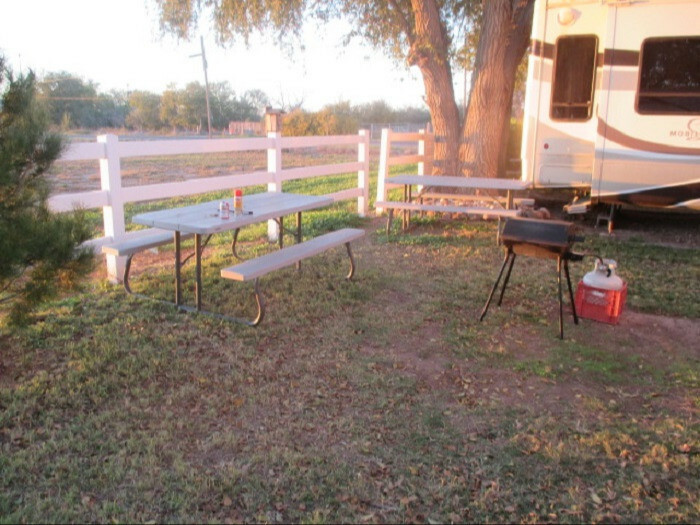 We camped at Red Barn RV Park in a Fifth Wheel. Very nice small RV park. Owner super friendly. Very clean and well kept. The big downside is the circuit breaker tripped 6 times with our small 22 ft RV at random times and there was a crazy amount of flies preventing us from grilling outside. Even entering our RV resulted in several flies entering our RV. I have never experienced such an intense fly problem including my time in very tropical regions in Asia. The owner was empathetic to our trip breaker issue and immediately fixed it. The flies are an issue in Roswell I am afraid. They were infested also across town including inside the local Walmart. 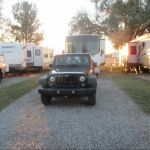 We camped at Red Barn RV Park in a Travel Trailer. Bring bug zapper for the fly apocalypse. What a find! 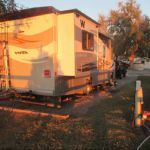 This is a small, family run RV Park that is the best in the area. The owners are SO helpful and take great pride in their business. The amenities are apropos for the size of the park (small laundry, clean restroom/shower facilities) and there have an honor system for snacks, drinks, etc. we would definitely stay here again, thank you!! 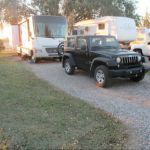 We camped at Red Barn RV Park in a Motorhome. Ask the owners for recommendations. Have so much knowledge and will tailor her input to your needs. Small park with about 20 or so sites. Easy access off Hwy. 380. We stayed here with a 33' travel trailer. Back in site was more than big enough for rv and truck without unhoooking. Very friendly helpful people. 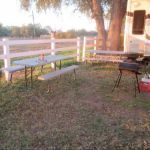 We camped at Red Barn RV Park in a Travel Trailer. I actually lived at the Red Barn for three years. The place is clean, quiet, and carefully managed. I couldn't have been happier. 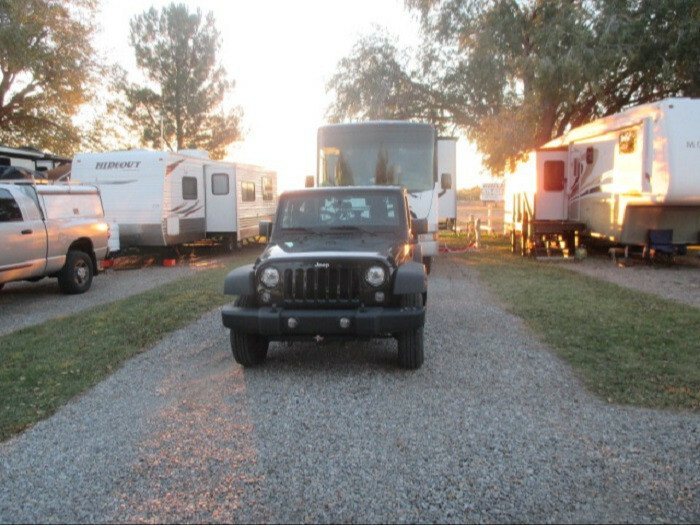 We camped at Red Barn RV Park in a Motorhome. Small but well run park. Small but clean laundry room and pleasant club room. 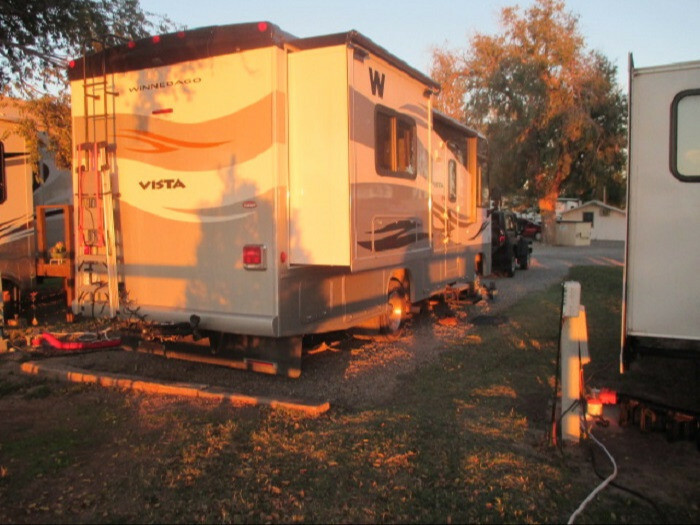 We camped at Red Barn RV Park in a Fifth Wheel. Great location for visiting Roswell. Roswell has many art galleries and museums that are very well done! We had planned to stay two days and ended up staying a week and still didn't see it all! We spent one night at this park in mid September en route to Colorado. We used one of the two pull through spots in the park. This is a small RV park, but it was fine for one night. We did use the laundry which is open 24 hours. They do have a lending library for books and DVD's which was nice. Also, an honor system for paying for the ice, sodas, etc. The park is located on the outskirts of town so you would probably have to unhook your toad to explore Roswell. The owner was very nice. 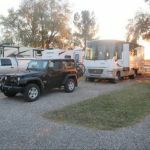 We camped at Red Barn RV Park in a Motorhome. This park is located on the outskirts of town. We did not unhook toad so not sure of restaurants nearby. Once you see the other parks available to you then you'll understand why Red Barn is head and shoulders above them all anyway but this is just a nice little place in general. The place is a little cramped (I've seen MUCH worse) but it's super duper clean and the owner is a doll. We had called ahead to ask about leaving our fiver someplace while we went into town for the day and they said we could leave it out front - in the end she said "just leave it in your spot, I'll tell anyone wanting that spot that they have to wait until 3pm". Who does that? Nobody does. This place DESERVES your business, do yourself a favor and stay here! 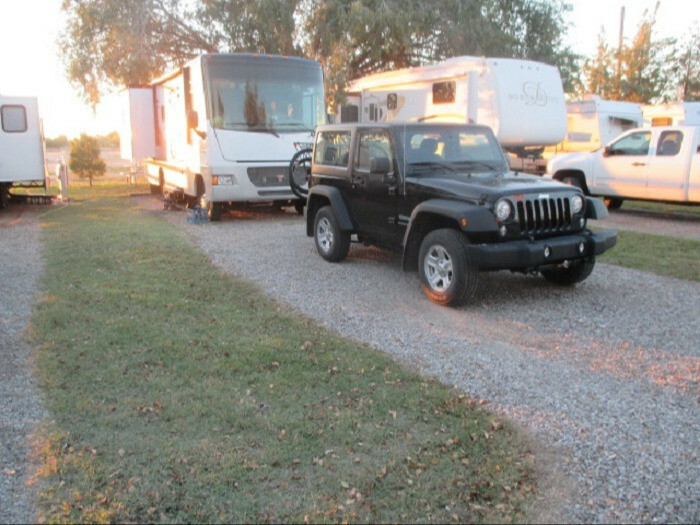 We camped at Red Barn RV Park in a Fifth Wheel. If you go to Roswell for the alien history then you may be disappointed, it's grown up into a "normal" city of 50,000 people now so it's no longer the cute little town it used to be and the whole alien culture has all but been wiped out. There are only a few little places left that celebrate Roswell's 1947 history. I was really sad to see that happen but the town, by itself, is a nice little place. The rate reflects a week stay. We originally booked a pull through however worried that the trees would prevent satellite reception so switched to a back in. While the park is small it is easy to get in and out of. The owner is very helpful and we liked having some treats available with the honor system. The dog walk area is through a dirt field and on a dirt road that is adjacent to the RV park and within a farm. After the first day we found a really nice park 2.5 miles away, right across from the zoo with paved paths that we used twice a day for good dog walks. The best thing about this park is the WiFi! We used it all week with no problems and it's fast! If in the area we would stay here again. We camped at Red Barn RV Park in a Motorhome. Loveless Park across from the Spring River Zoo is great for walking your dog! Chef Toddzilla Mobile Cuisine is worth going to for a juicy yummy burger! This is a very small park next to farmland. Dairy farmland. Note that means you will be smelling dairy farms and it will make you greatful for the huge winds that sometimes roll through. The smell is potent when it's not windy. However, I will say that as parks go, this is a nice little park. Very well-kept, very nice manager (owner? I'm not sure. She was really nice and helpful.) 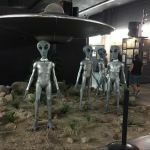 Spots are close together but for a few nights to see the UFO Museum, it's doable. This is one of the only RV parks with trees, and the ownder planted them all herself - she really cares about the place and loves it, and you can tell. They were redoing the bathrooms when we were there, but they were still usable and clean. There is a little laundry on site and a DVD lending library with some good movies you haven't seen in awhile. There's even a little store and I was so grateful for that water while my husband was hooking everything up, because the desert makes you so thirsty! Very reasonable prices too. If I am ever in Roswell again, this is the RV park I'd choose. Oh, and the space might look tight, but she has two spaces that have gates on the other side, so when you pull in, she opens the gate when you leave. It was slow but we got our 40' RV and a tow vehicle in there, so don't think you can't fit just because it looks tight. We camped at Red Barn RV Park in a Motorhome. Obviously go to the UFO Museum. Why else are you in Roswell? 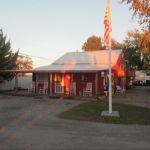 Stayed at Red Barn RV for 2 nights in mid-March. Owners are helpful and friendly, with many suggestions of places to see and things to do. We contacted the park in November 2016 to make a reservation for March 2017. We were promised a site, but there was no advance deposit and no reservation confirmation. Just to be sure, we called a week ahead of our stay dates and were told we had a site. Our site was very very close to neighbors on both sides (both were long-term renters). There are picnic tables at each site, but if we had used ours we would have been within only a couple of feet of our neighbor - not comfortable. The park is very small (14 spaces) and it seemed the majority were being rented long-term. The park is easy to find, right off a road a bit out of town, and is adjacent to farmland so is relative quiet. It is convenient to town and has a tranquil feel. We did not use the common areas. We camped at Red Barn RV Park in a Motorhome. Los Cerritos Mexican Kitchen restaurant had great affordable mexican food. All City of Roswell museums have no entry fee. Call in advance to be sure that you will be able to get a site here. Taco Tuesday at Los Cerritos but get there early! The Pasta Cafe on the main drag heading North out of town is a great place to eat. Carlsbad Caverns 2 hours away. Many museums, military museum with a high school and junior college. Lots of good restaurants. Nice town to visit. Couple of miles from downtown rosewell, nm. The Cowboy Cafe just west of the park is a great little restaurant for breakfast or lunch. Had some trouble with motorhome... electrical, of course. "Red Barn" owner recommended "MAIN Trailer Sales". This is strictly a trailer and 5th wheel dealer but they have a great staff of mechanics and service men that were very knowledgeable in all things RV. The problem was solved in a couple of hours, and I got a schooling in RV maintenance. Don't let the facility fool you, a neat shop doesn't make a good mechanic. The UFO Museum is really fascinating. Lots of details and local information on the 1947 Roswell incident. It's a must see when you are here. 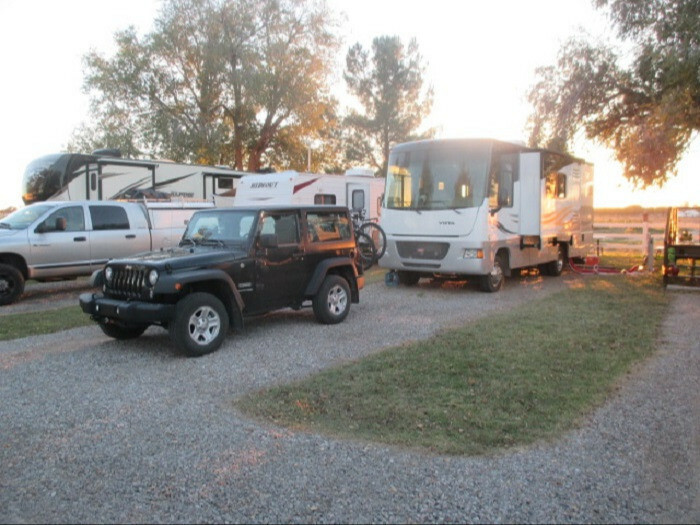 Are you affiliated with Red Barn RV Park ?